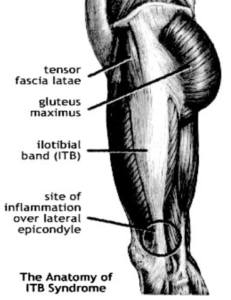 The iliotibial band is a long tendon that runs down the outside of the thigh and inserts on the side of the knee. It provides stabilisation to the knee in the walking and running motion. With repeated bending/straightening of the knee, the iliotibial band (ITB) rubs against the prominent bone on the outside of the femur (thigh bone) at the knee. This friction may lead to an inflammatory response. In particular, the bursa (fluid filled sac), that lies between the tendon and the outside of the femur, may swell. It is characterised by an ‘ache’ over the outside of the knee that with progression of the condition, can persist during exercise. It may even cause the athlete to stop exercising or ‘limp’ afterwards. Rest, without rest, the ITB will continue to be inflamed. Reduce the Inflammation by applying ice regularly. Anti-inflammatory medication may also be prescribed from your doctor. Massage plays an important part in allowing the band to stretch by ironing out any tight knots or lumps in the ITB. Increasing the strength of the quadriceps and pelvic muscle stabilisers (ie gluteal muscles of the buttock), to reduce the workload of the ITB. Stretching the ITB can be started once the pain and inflammation has gone, and should continue long after training has resumed. Correction of training principles to ensure that the ITB can ‘progressively’ adapt to the demands placed upon it with training. Corticosteroid injection is sometimes performed if the patient is severely restricted in general movements. Copyright © 2016 Beechboro Physiotherapy. Made by Creativethirteen.